For most of his life, our son Steve has had a serious case of beetle mania. By the time he was five he knew more about insects in general and beetles in particular than I did. Of course, that’s not saying much. I’ve always specialized in the colorful, charismatic insects such as butterflies, praying mantises, and walkingsticks, although when Steve showed me my first eyed click beetle (Alaus oculatus), with big, black, false eyes on its thorax, I was impressed. But not impressed enough to make my own study of beetles. I let that up to him.And over nearly four decades, he has forged ahead, aided and abetted by his friend Sam Wells who has a Ph.D. in entomology. (Steve’s Ph.D. is in linguistics.) But beetle collecting has remained his avocation, and he and Wells have amassed an enormous collection. During Steve’s linguistics studies in south India and Sri Lanka, he managed to find time to collect beetles. And last summer he and Wells went on an official collecting trip to Honduras. Steve returned enthusiastic about the specimens they had found there, but he was equally enthusiastic about surveying the beetle species on our property. As a boy in the 1970s, he had studied and collected beetles here, and he was particularly interested in re-finding the same species and discovering new ones. His not-so-hidden agenda was to get me involved in the project. That’s why, on an overcast, humid day in late August, I met him halfway down our hollow road. Even though he’s now six foot, three inches tall, I could still see the little boy he once was as he held his bug net in one hand and a large, black beetle in the other. Slightly over an inch long, it was a hermit flower beetle Osmoderma eremicola, one of the largest beetle species on our property. 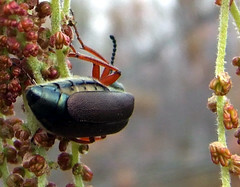 A member of the Family Scarabaeidae, this beetle is one of approximately 1375 scarab species living in North America. Steve had found it crawling on the ground and told me that it eats leaves. 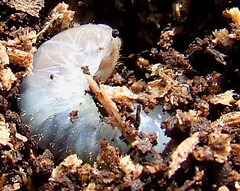 Rotten logs harbor its large, white larva–a sausage-fat grub that we later found in a tulip tree log. 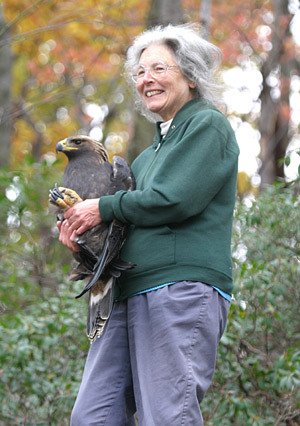 “The ‘ick’ factor is great in this species,” Steve said. An understatement as far as I was concerned. But when I looked it up on the web, I discovered aficionados of Osmoderma eremicola who gave precise directions on how to raise this “neat, bulky beetle” from larva to adult on a diet of rotten wood, old leaves, dog food, and compost. “The sheer biological success of beetles outstrips every living thing,” Steve enthused as we walked along. “Maybe one reason is because of their body shape and makeup. Two of their four wings evolved to plates of armor on the outside.”Beetles belong to the Order Coleoptera, which is Greek for “sheath wings.” Although beetles have two sets of wings like other insects, their front wings are hardened plates that protect their flying wings and body from predators. And beetles are common. One in four of the known species on Earth is a beetle–350,000 species and counting. They are also ancient. Before dinosaurs there were beetles, but once dinosaurs disappeared and flowering plants proliferated, so did beetle diversity. That’s because most beetles subsist on flowers and plant foliage, and the more diverse the plants, in the tropics, for instance, the more diverse the beetles. We continued on our beetle foray, which meant, Steve informed me, inspecting rotten logs, “one of the best places to find beetles,” along with fungi and feces. Luckily, we didn’t find any of the latter. Under the bark of a rotting log, Steve found rove beetles, members of the largest North American beetle Family Staphylinidae with nearly 3100 species. 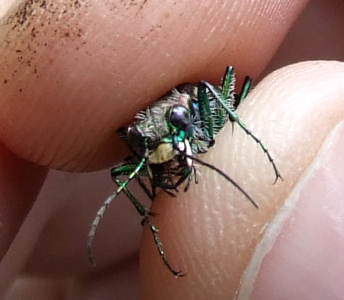 The rove beetles were so small I whipped out my hand lens to examine one more closely. Only then could I see those shorter wings and protruding abdomens. To be honest, I hadn’t even noticed the tiny beetles when he ripped off the bark, but Steve’s incredibly sharp, birder’s eyes had. He also showed me a dark orange wire worm that is the larva of a click beetle, a millipede and its pile of frass, which consists of the remains of bark that it eats, and another beetle, even tinier than the rove beetle–the cerylonid beetle Cerylon castaneum. A member of the Family Cerylonidae, it does not have a common name. Only 18 species of these beetles live in North America, and because they are tiny and secretive, scientists don’t know much about them except that they are plentiful in forest litter and under bark. Along with all the insects under the bark, we also found an insect gourmand, a golden-backed, mountain dusky salamander–Desmognathus ochrophaeus–whose favorite foods include beetles and beetle larvae, worms, fly larvae, sowbugs, snails, ants, mites, springtails, spiders, and caterpillars. Its favorite habitat during the summer is a moist deciduous or mixed hardwood-coniferous forest near a stream, such as we were in. But eventually we left the hemlock/hardwood forest beside our stream and headed up Pit Mound Trail to Ten Springs Trail, where the trees are young and striped maple saplings dominate the understory. Steve immediately began a paean of praise for striped maple trees because both click and soldier beetles like to sun themselves on striped maple leaves, especially in early summer. Since it was then late summer, he didn’t find any examples, but I was happy to hear a good word in favor of a tree species often belittled by foresters, especially because I like its green and white striped bark, lovely, dangling flowers, and big, shiny leaves. In the old garden of our long-deceased neighbor, Margaret, lay several wild black cherry logs.”Now black cherry logs usually have a nice selection of beetles,” Steve said. But he found only ants under one dry section, and beetles like moist conditions. 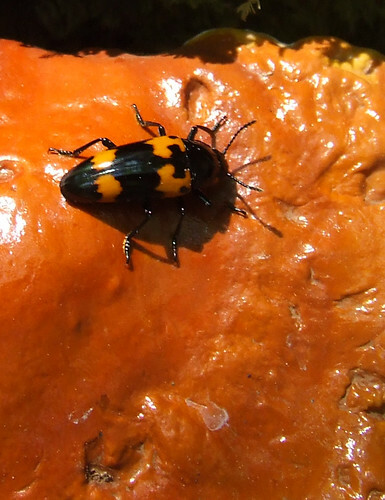 “Generally beetles avoid portions of logs that have ants because ants prey on beetles,” he explained. As he walked on, I idly pulled the bark off farther along the log where it was still moist despite the recent drought and discovered what Steve had been searching for, the Pennsylvania darkling beetle Alobates pennsylvanica, the largest and one of the most common darkling beetles in the eastern United States. Ungainly and slow-moving, it lives under the loose bark of dead trees, logs, or stumps. A member of the Tenebrionidae Family, it is one of 1300 species found in North America. To my untrained eyes, it looked like just another big, black beetle and much like the first big, black beetle Steve had showed me. The wild oregano I had given Margaret a quarter of a century ago had spread throughout her yard, and its small, orchid-colored flowers swarmed with nectaring butterflies. 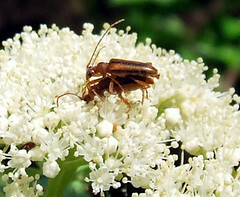 It had also attracted the first colorful beetle of the day, the Pennsylvania soldier beetle Chauliognathus pennsylvanicus of the Family Cantharidae. Dozens of these yellow and black beetles sporting elegant, long antennae, crawled over the wild oregano. This same species is common on goldenrod and is one of 455 North American species in its family. Steve also pointed out tiny black leaf beetles in the Chrysomelidae family, the fourth largest beetle family in the world, of which there are 1474 species in North America. This species too likes goldenrod, as we discovered when we reached First Field, which was aglow with five species of goldenrod. In addition, the goldenrod contained tiny, oval-shaped, shining mold beetles (Stilbus apicalis) in the Family Phalacridae as well as one of my favorite beetles, the pink-legged, black and yellow locust borers (Megacyllene robiniae), a longhorned beetle of the Family Cerambycidae. Longhorned beetles have some of the showiest members of the beetle Order. “You can judge the diversity of a forest by longhorned beetle diversity,” Steve said. “The Coleoptera glory in the eastern United States are the longhorned beetles,” and he hopes over the next couple of years to find as many species of them as possible on our property. As part of his campaign to get me involved in collecting longhorned beetles, he later gifted me with a Field Guide to the Northeastern Longhorned Beetles by Douglas Yanega and published by the Illinois Natural History Survey. Filled with colored plates, Steve described the book as “all you’ll ever need to identify longhorned beetles.” Well, maybe. But what about all the other likely beetle species on our property? During our walk, we had seen representatives of eight of the 98 beetle families, listed in Beetles, a Peterson field guide by Richard E. White, and already my head was whirling. To further confuse me, he told me of a few interesting beetle discoveries he’s already made here. 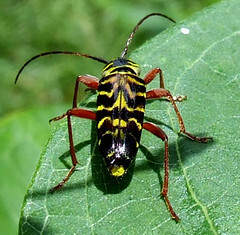 In early summer, he had found the false longhorned beetle Cephaloon lepturides of the Family Cephaloidae, which has only 10 North American species. This species is also a flower and foliage denizen, although its larva lives in decaying forest logs, and it is known (among entomologists) for its stout, comb-like claws. Back on May 28, 2006, a false click beetle Melasis pectinicornis had come to the light on our veranda. One of the 67 North American species in the Family Eucnemidae, it has brush-like “horns” on its antennae. He also collected 15 species of tumbling flower beetles, 10 of which he found on the wild hydrangea growing on our road bank down in the hollow. Members of the Family Mordellidae, there are approximately 204 species in North America. Best of all was the rare beetle Steve had found near a huge, old, rotten oak log at the edge of the Far Field, a reticulated beetle of the Family Cupedidae, the most primitive of all the beetle families. According to White in Beetles, “Fossil cupedids from upper Permian deposits (about 200 million years ago) are the oldest known remains of beetles that belong to a living family.” Today that family contains four North American species including Steve’s discovery here–Cupes capitatus. We also have the most common cupedid species in the eastern United States–Tenomerga concolor. Both larvae and adults feed in moist, rotting softwoods and hardwoods, especially oak, chestnut, and apple trees. After our walk, totally confused by the many species we had seen or discussed, I remembered what my husband Bruce had said about Steve when he was five years old and had appropriated my new Peterson Field Guide to the Insects of America North of Mexico by Donald J. Borror and Richard E. White. All photos by Dave Bonta. Mouse-over for i.d.s, or click on photos to see larger originals.